Oh how I love cheesecake....and rulers too! Food and quilting....what more can you want! Love the rulers...wow! Double Hoping and Dual purpose rulers. A 2fer! Thanks for a great story and a very enjoyable blog hop. The recipe sounds great & like one that even a noncook could make. Thanks for the ruler review. I am anxious to try them out. Nice review~ I'm going to have to be on the look out for these rulers! And the recipe sounds yummy! Thanks! I will try that cheese cake. Sounds very yummy!! Been fun keeping up with the ruler hop!!! My husband loves cheesecake. Your recipe seems to be an easy fix. We'll have to try it soon! Pat Sloan has always rocked, but this time she out does herself with these rulers! Even with the oopsie in the quilts, I think you did an amazing job. What a great idea. I can't wait to try your cheesecake recipe. Sounds great! Your quilt story is great! Wow, you cranked out that second one in no time :) Too funny about the mistake (I surely wouldn't have known). Thanks for the review and chance to win. great quilt story - I hadn't thought of the Greek alphabet in years. Who doesn't love cheesecake??? Thanks! Can't wait to try one of the rulers :). Can't wait to try these rulers. Keeping our rotary cutters sharp will save us some money. More to buy fabrics, yeh!!! New rulers, cheesecake Y.U.M. to both!! 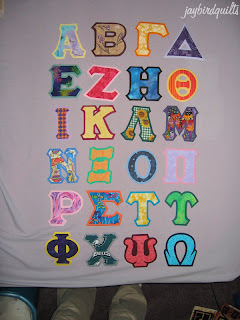 Lol, your quilt made me start singing the Greek Alphabet Song to myself! Alpha, beta, gamma, delta, little epsilon! Thank you for the great recipe. My family loves cheesecake. Hope I win the rulers. I have some but really really want these new ones! Your first quilts looked pretty good - thanks for the recipe! What a great giveaway with the rulesrs, thank you so much! Thank you so much for joining me on my blog hop! I so love your quilt story! Amazing you made 2.. and lovely your friend KINDLY told you about the letter! Of course I have no CLUE which one it is... hehe! And GREAT friend to lend the recipe! Friends ROCK! Would love to own these rulers! Cute story...great recipe! I would love to win the rulers. I had no idea the size of the rulers - what great sizes to have!! Thanks for the recipe and your Greek quilt is super - what a good idea!! Our rotary cutters can stand to be sharpened to extend their lives. Great ruler idea. I also like your "no leftover cheesecake" recipe. I've visited Amanda's blog and I'm looking forward to tomorrow's blog stops. oh boy cheesecake is my favorite. cute first quilt. thanks for the recipe. Mmm chocolate covered pretzels.. anything chocolate! Magic! MMM Cheese cake Thanks giving is coming up soon in Canada I should make one to have in the evening after pumpkin pie of coarse. cool rulers I wish the thought of them had come sooner I go through blades alot considering the price of them. The rulers look really great - I didn't realise you could get a ruler as long as 37"!! Aren't these rulers just the best idea? I just love all the details on them. You story is so funny! Hopefully I'll learn my lesson to double check before putting the whole quilt together from you and not make that sort of mistake myself. THANKS! Love notions amd gadgets, can't wait to buy one to try out! Hope I can win a set instead! Your cheesecake recipe looks Yummy!!!! Thanks for being part of Pat's Blog Hop. Hmm,that's gratitude for you. criticism about a gift. . . makes you wish you hadn't let Bobbi have one, huh? Those rulers really sound amazing. I'd LOVE a set!!!! I've tried one of the rulers, but I'd just replaced my blade ... have to try again with a dull blade to see the difference. Your cheesecake is so easy, a must try! Thanks for the chance at winning the rulers. Great rulers !!!! Hope to win some. Cheesecake, yummmy. Thanks for the blog, I read it all the time. It is full of great information. Thanks for the chessecake receipe. I am excited to try the new rulers. I plan on buying some as soon as I get home from my vacation. Thanks for the chance at the giveaway. It's fun to find a recipe each day along with the giveaway-like our very own cookbook. The rulers look innovative and very useful; I'd love to win! Thanks very much. Whoops, not sure if my comment went through--so this must be eliminated if you have my first comment! Apologies for any mixup. The rulers will be a great treat for whoever wins them; good luck to everyone. Great blog! I love cheescake too! These new rulers sound wonderful! lovely review. And what a great quilt! It is so sweet of you to make a second for your other friend! I will be interested to see these rulers in action, in person. That 37" ruler should be a winner. I can't wait to try these rulers - or that cheesecake recipe!!! Thank you for an "Easy" cheesecake recipe! Cheesecake is my favorite ... thanks for the recipe! The rulers look awesome! Cheesecake sounds so good right now. Its a nice idea with an edge sharpener. Good review. I really like the thought of having a 37 inch ruler. I try and cut my borders first so I don't have to piece them. Thanks for the great review and recipe! Sharpening rulers are a brilliant idea! Can't wait to try them out! These rulers are definitely going on my "gotta have" list! Thanks for the chance to win. Flaws make things unique. Even though I wasn't in a sorority, I like your quilt! mmm, cheesecake! wonder if it'll work with soy "cream cheese" - darned husband is lactose intolerant. love the rulers! would love to win a set. Enjoying the chance to win everyones post have been very interesting to read so far. These rulers look just what I need. What a great idea. BTW your comment post does not allow for user name and URL which is how I have signed in to the other sites so I ma leaving that info here so that you know I have posted on the other sites as well. I do like the look of these rulers, without the million of little tiny measurements on them. I can't imagine owning a ruler that is 37" long! 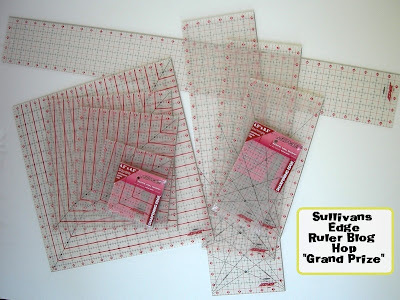 before all these blog hop thing with Pat Sloan , I've never heard of these Sullivan rulers and I just love to hear feedbacks from blogging quilters like you. New things needs good review...I'm pretty much a notion junkie myself :P but who doesn't love notions, right? 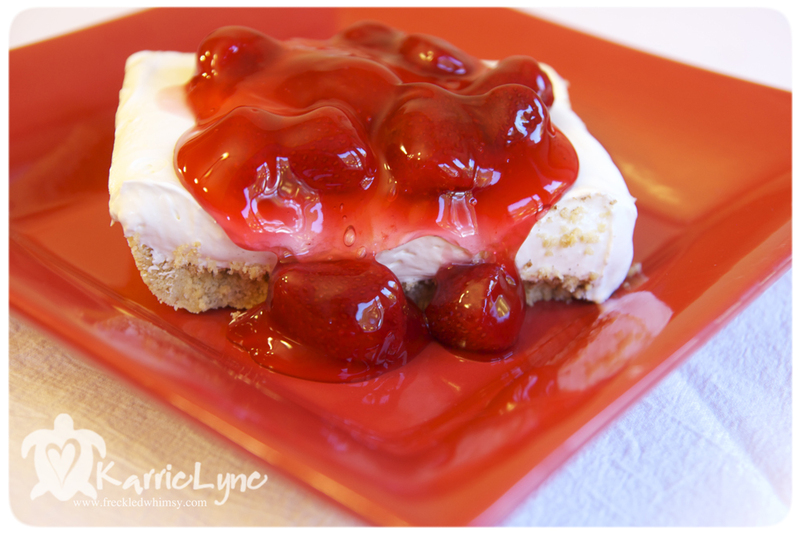 Thanks for sharing your quilt story and easy to make cheesecake! grandkids, it does sound dangerous! An easy cheesecake recipe that I'll have to try...and a chance to win Pat Sloan's rulers......Wow, thanks!!! The rulers are great. I would love to win one or all. Thanks for the review of the rulers. I would love to have a yard-size ruler--very handy in measuring for borders and backing. The rulers look and sound (?) interesting! That long should be a winner. The cheesecake recipe looks fabulous! Also, I loved the story of the quilt for your friend...you really have a lot of perseverance. I'd love to win the rulers! These rulers sound great. Thanks for a chance to win. Thanks for reviewing some of the sizes for the rulers. 37" is a much longer ruler than I have, but would be good for trimming. Your quilt is really colorful and fun. Thanks for the cheescake recipe...who can resist? Wow, that long ruler would be awesome to own. Thanks for the review. Day three of the blog hop giveaway. Wow, I am finding some fantastic blogs to visit. Thanks. My son wants to try your recipe--guess we'll be having cheesecake soon! The rulers sound great--thanks for the chance to win! Your recipe looks wonderful! The rulers are definitely something I must try! Thanks for sharing your experience and thoughts with us once again! I would love to win the rulers. Cheesecake AND a chance to win rulers!?! It's all too much! ok, so it's not! I'd love to win these rulers, especially the 37" long one. I'm drooling at a the prospect of a ruler that long. Not only do I love a chance to win these rulers I really am enjoying reading new blogs. Loved your story about your quilts. I don't know anything about Greek letters so I had to go through each letter before I found the mistake. Thanks for the cheesecake recipe! The rulers look so cool, I would love to win them! I would love to win new rulers. They look awesome. Our family makes this kinds of cheesecake too. Quick and easy. As always, I enjoyed your review; your college quilt (I still don't see your boo-boo) and your non-foody recipe (I can never say 'no' to cheesecake anything). I like the idea of a 37 inch ruler too - and one that keeps your blade sharp is a bonus! Sounds like you had good experience with the rulers! Good to know! I really enjoy your blog...one of which I keep on my feed. I enjoyed your story about double checking your work...I think we've all made a few mistakes like that. Awesome review! This was a fun post to read. The recipe looks totally YUM. I loved the "Do not use low fat" for the cream cheese. I know there's a reason for it but it made me chuckle and think to myself, "Self? Who would want a 'low fat' cheesecake anyway?" It also made me feel "good" that a talented quilter such as yourself can make mistakes and be okay with it. Thank you for sharing this! The rulers sound really neat. Thank you for the story and the recipe! Great story about the quilt. Chocolate and salt - what could be better. I actually like it better than - gasp - cheese cake. Here's hoping the rulers will soon be part of my tool case. Those rulers are so amazing!! And, that cheesecake sounds absolutely sinful (I must make one!) Thanks!! Am enjoying the blog hop. Rulers that can sharpen the rotary blade while cutting is a great idea. Will continue to follow jaybird. Mmmmmmmmm cheesecake, but not for me. I am dieting . . . again! Would love to try out these innovative rulers for myself. Have already added the ingredients to my shopping list! Thanks for the review of the ruler, very helpful. Did the long ruler stay in place when you cut? I have enough trouble with shorter ones when I make a long cut. I really need help keeping the ruler where it belongs. Thanks for the recipe,too. Oops! Just a small mistake! LOL. Those are some awesome quilts. And some awesome rulers! Enjoyed reading about your first two quilts! I'm trying hard to pretend that I didn't see the cheesecake recipe. LOL! I'm also enjoying reading about what each of you think of the new rulers. I love the recipe for cheese cake, my favorite dessert. I love your blog, you always have something creative, interesting, and inspirational. The rulers are an awesome creation. Yummy recipes. Great Rulers. It all goes together. Hope I win. Wow can't wait to try the rulers. I love the no skid feature and no little feet under. I also love cheesecake, this recipe looks great and easy. Oh, my! You could have posted the chocolate pretzels twice ..... they are that good! Yummmmmmmmmm. I would seriously love to get my hands on these rulers. You are so lucky to have them! I'm keeping my fingers crossed. Thank you for the review and for the opportunity to win! These rules look really great. I only have two rulers and would love to win these! I'm looking forward to seeing these rulers. This looks fantastic! Please count me in, thanks! Gotta love those humble spots in quilts! And cheesecake,,,yummo, thank you for the recipe! I love these rulers....great features! Thanks for this opportunity and the recipe as well! Wonderful story. The recipe looks delish! yes, letters are so tricky! my problem is that i reverse images (accidentally) with fusible applique, and get to "practice" it again! Cheesecake sounds so good right now! I'd love to try out these new rulers. Love the blog hop and the recipes. Wonderful review of the rulers - I need to stop doing this first thing in the morning - now I wasnt cheesecake for breakfast. Thanks for the ruler review. The cheesecake recipe looks like a winner. Happy Blogging! I had not heard of these rulers before this hop. What a great idea. Great first quilt and story! The cheesecake recipe looks wonderful. 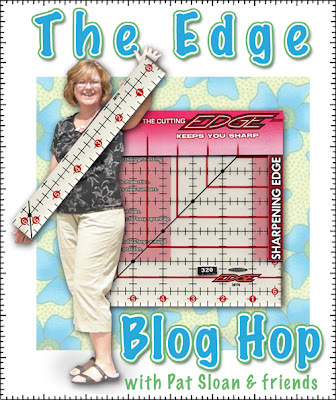 Thanks for joining Pat in the blog hop and trying out the rulers. Can't wait to try them out myself. YUM! Love cheesecake, and the chocolate covered pretzels are a must try :) Thanks for sharing the quilt stories. I need a new set of rulers so badly! My are so nicked from all the gouges years ago when I was learning to use the rotary. These blog hops are a fun way to see blogs one wouldn't know about otherwise. have an awesome day! Thank you for the review and "it's all Greek to me" story. Even with the mistake, there was a bidding war! How awesome! Can't wait to try a glutenfree version of your cheesecake recipe. Thanks for participating in the giveaway! I can hardly wait to try one of these rulers! THANKS,JULIE FOR THE REVIEW,RECIPES AND SHARING! Forget the rulers, i want the cheesecake! j/k, i want the rulers too! Cheesecake with graham cracker crust is always the BEST. Thanks for the recipe! and for the effort you put into blogging. 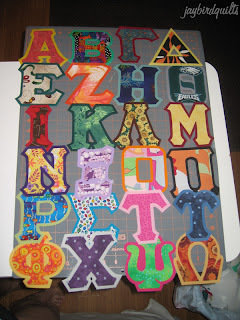 Should anyone ever comment about the reverse letters, just tell them you did your humility block early in your quilting career to get it over with! Looks like another great recipe, thanks for sharing! The cheesecake looks so good!!! I like the ruler... it is interesting that the edge actually sharpens the rotary blade - what a plus! I will have to look for them for my quilting/sewing friends for the holidays! YUM! Happy Blog Hoppin' to ya! Great quilts! And cherry cheesecake is one of my faves! Would love to win. The cheesecake loves wonderful! Playing catch up for this blog hop. I've been fighting a cold all week and have fallen behind on my reading. Thanks for your info on the rulers. I'd love to try these rulers - they sounds really interesting! Recipe sounds delicious and easy to make! Thanks for the recipe. I'd love to try the rulers. Would love to have these ruler. What a clever idea with the edge. Love cheese cake will have to make this one. It sounds easy. These rulers sound like they need a home in my sewing room. I only hope they find their way here. Please count me in as I would love to win these rulers!! Thanks SEw much! I love the apple pie. Thanks for the ruler review. They sound like a good thing to have in the sewing room. good review the recipe's not bad either. Thanks. Thanks for your review on the rulers - they would certainly make a nice addition to mine and Mom's quilting corners! But I am wondering... what is the life span of the sharpening edge of the ruler? Hope its 9-lifetimes, cuz we quilters have too many projects for just one! Thanks for the cheesecake recipe too! I'm still trying to see the letter that was done wrong! Mmmmm that cheesecake looks yummy! Would I ever like to have a piece, but not as much as I would like to own those rulers! I missed commenting on your actual day, computer malfunction! Nummy looking cheesecake! Always love a good cheesecake. 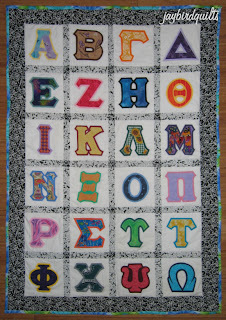 Have made an alphabet quilt for one of my sons, but never considered a greek alphabet! Very clever. I love cheesecake!! That recipe looks so yummy. Oh man - that cheescake is making me hungry! Thanks for the chance! What a fun contest. Thanks for the opportunity! Thanks for the fun/recipe/and a chance to win the rulers. Great blog hop. Thanks for the review! Mmhm, cheesecake! Thanks for the review. When new stuff comes out I like to hear what others have to say about them. These would come in handy for my new quilt I'm planning!!! I'm super excited :) thanks for the chance!! I looked and looked and couldn't find your mistake. The quilt looks good anyway. :) Thanks for the recipes! These rulers would be nice to win! Loved reading your blog, especially the older one about how long it takes to make a quilt. Very touching. Very nice quilt! 99% of the world would have never noticed the switch. I would love these rulers. Mine are now chipped and sad. These sound wonderful in more than one way. I'd love to receive the rulers. Thank you so much for the honest review and the honesty of your Greek quilt ... its heartening to know mistakes happen even to the best of the best! Awesome job on those quilts!! I would love to win a set of these rulers - they are amazing and I have never seen anything like it before!! Thanks for the chance. Wow! I love cheese cake and this looks easy to make , I also like the looks of the pie and choc covered pretzels ,another favorite is with white choc. It sure would be nice to win the rulers . I love following your blog and thanks so much for the chance to win a ruler. It's been a great blog hop. Lots to learn and share. Love the blog hop and those rulers look great! I really can't wait to try thr rulers and that I am a sucker for cheesecake. Can't ait to try that too. Thanks for your review. I like that your reviews of products include both positive and negatives (when appropriate). It helps me make educated decisions. Thanks for the honest review on the rulers. Would love to try them out. When I seen your sorority quilt I was reminded of the quilt I just did for my daughter. She is the president of the knitting society at her university and I made a quilted banner for her during the sign up week for the clubs. She called me 2 days later to say that it was stolen. I don't know who was more heart broken and I remembered I didn't even take a picture of it. Late to the party, but I made it! It was that cheesecake recipe that was calling my name!!! Can't wait to try it! Well, I've tried twice to leave a comment - don't think anything has posted. Hi Julie, I would like you to do a couple of favors for me. First of all, make up a batch of that cheesecake (a double batch if you'd like), and then mail it to me (snail mail, that it). Second, call up Pat and tell her not to mess around with that random number thing and to just send the rulers to me. I really, really want them. I have a similar cheesecake recipe that is very popular in our house. 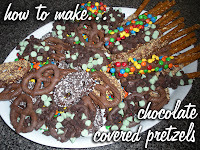 Your chocolate covered pretzels look delicious too. Thanks for the opportunity to win the rulers. It sounds pretty neat that they can help with keeping the rotary cutter blade sharp. Thanks for the review and recipe-these rulers look great! Thanks for the blog hop. It has been fun. The rulers sound wonderful. Love the blog hop. Thanks. Today at my local quilt shop, the owner had some of these rulers and they look wonderful. I have loved all the web sites to visit. The cheese cake recipe is a must try. Thanks so much. I am so excited about the new rulers. Today at our local quilt shop, the owner had some and they look wonderful. I have loved all the web sites to visit. Thanks so much. Your recipe looks yummy! Going to have to try it sometime! Thanks for the chance to win these rulers!